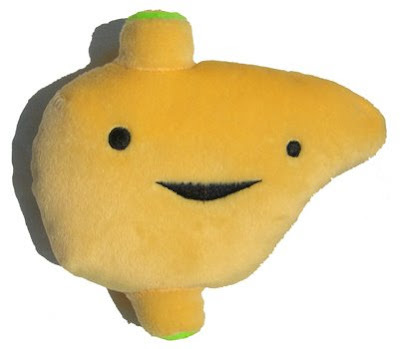 You can buy your very own liver plush toy here. I've learned that if I want to have four relatively active days per week, then the other three days need to be spent with my hindquarters planted firmly on the couch for the afternoon. Resting is a boring thing. It's amazing the direction my thoughts take while half-asleep with Maggie snuggled on my lap. Last week, I was thinking about my prescriptions and the fact that I needed to refill several of my pills. I remember drowsily musing about the hard work required of my liver to metabolize all those medications, which prompted me to actually feel sorry for my liver. Yes, I felt pity for my internal organs. This is very strange. I know that. Can you imagine what my liver would say given the opportunity? "Girl! Another round of methotrexate? Are you kidding me?" "Put down the lemon drop martini........I'm on overtime the way it is.."
"We need to talk. All this adipose tissue is invading my personal space. Lay off the cookies." "Do you know what they put in diet soda? Work with me here!" Awww. Poor, poor liver. Maybe my innards should form some kind of support group. 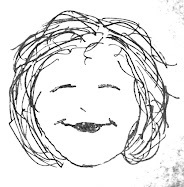 Yeah - the group could be called something like Help Us - We're all stuck inside Julia. I'm certain that Dr. Phil would book us on his show once he got wind of my poor liver's plight. I can see it now. I'd be sitting on a couch on the Dr. Phil set, looking guilty. My liver would be seated right next to Dr. Phil tearfully explaining her circumstances.....wait, can a liver be tearful? (What am I saying? I'm talking about a liver on a television program, for crying out loud. Wake up, Julia, wake up! This is extremely weird, even for one of my dreams). Anyway, Dr. Phil would periodically glare at me as the story unfolded. The audience would groan in disbelief as I tried to share my side of the story. Dr. Phil would offer folksy yet common-sense comments intended to rectify my irresponsible liver behavior. The episode would end with my heartfelt promise to be a better liver owner. My liver and I would embrace, at least as well as could be expected given that a liver doesn't have arms. And would probably be pretty slimy. I'll be a better, um...owner....liver. I promise. Our poor livers. I fed mine a delicious cocktail last night, but I'm always mindful of being careful. I so think the same thing when I down my Plaq + 5 other drugs every night. Every time I have to take advil or naproxen I think I can hear my liver screaming something along the lines of, "Please no more...I can't take it!" or "Put the meds down and step away slowly or I'll stop processing the toxins in your body!"